TRIPOLI, May 22, 2011 (AFP) - NATO warplanes early Sunday carried out raids against the port of Tripoli and the residence of Libyan leader Moamer Kadhafi near the centre of the capital, a Libyan official said. "There were two raids on the port and Bab Al-Aziziya", the residence of Kadhafi which has already been targeted several times, the official said. Earlier, around 12:30 am (2230 GMT Saturday) an AFP journalist heard two explosions and a fighter plane flying over the capital at low altitude. Taken out in a bus by the authorities, international correspondents were unable to gain access to Kadhafi's residence. An official said after talking to guards in front of the immense residence: "They're expecting new raids, we don't have permission to go in." Earlier NATO warplanes hit eight vessels of Kadhafi's navy, the alliance said as US President Barack Obama answered constitutional questions regarding the length of the Libyan conflict. Meanwhile, authorities in Tripoli slammed Obama as "delusional" for earlier suggesting that the veteran Libyan leader's departure is inevitable. They also strongly denied reports that Kadhafi's wife and daughter had fled to Tunisia and that Oil Minister Shukri Ghanem had defected. 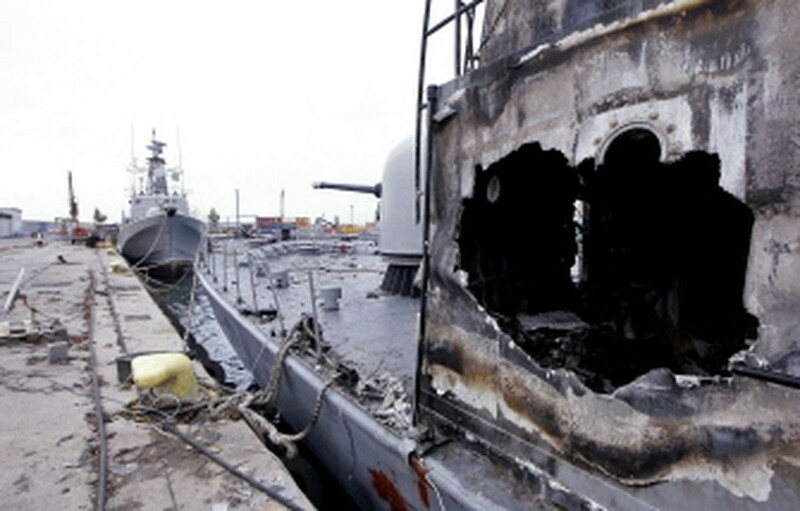 NATO said it carried out "precision air strikes" in the ports of Tripoli, Al-Khums and Sirte, striking eight vessels. "Given the escalating use of naval assets, NATO had no choice but to take decisive action to protect the civilian population of Libya and NATO forces at sea," said Rear Admiral Russell Harding, deputy head of the NATO-led air war. Harding insisted that all of the targets hit were military but government spokesman Mussa Ibrahim accused NATO of seeking to scare international shipping firms into steering clear of government-held ports. British aircraft targeted Al-Khums, the nearest naval base under the control of Kadhafi forces to the rebel-held city of Misrata, British defence staff spokesman Major General John Lorimer said. "As well as hitting two corvettes in the harbour, the Royal Air Force Tornados successfully targeted a facility in the dockyard constructing fast inflatable boats, which Libyan forces have used several times in their efforts to mine Misrata and attack vessels in the area," Lorimer said. "The destruction last night of the facility and a significant stockpile of the boats will reduce the regime's ability to sustain such tactics," he added. NATO has increased the pressure on Kadhafi by hitting several command and control centres in Tripoli in recent days. "This has limited Kadhafi's ability to give orders to his forces. It has also constrained his freedom of movement; effectively he's gone into hiding," NATO's Wing Commander Mike Bracken said in Brussels. In Tripoli, the government spokesman described as "delusional" Obama's prediction in a speech Thursday that the veteran Libyan leader's departure is inevitable. "Obama is still delusional -- he believes the lies that his own government and own media spread around the world," Ibrahim said. "It's not Obama who decides whether Moamer Kadhafi leaves Libya or not. It's the Libyan people who decide their future." Obama sent a letter to Congress, asking for political support of US action in the NATO assault, as he hit a technical 60-day deadline to get official congressional approval for the use of his war powers. The White House maintains that its support role to allies does not merit a formal declaration of war as is required by the US Constitution. It also said the action falls short of the kind of campaign governed by the 1973 War Powers Act that requires any military action longer than 60 days to be authorized by Congress. But in a letter, Obama said it would be helpful instead if lawmakers backed a binding resolution to underline US support. Also, African Union leaders will gather for an extraordinary summit in Addis Ababa next week to discuss the Libyan conflict, the organisation announced. Last month, pan-African body proposed a truce but it was rejected by rebels, who insisted on Kadhafi's departure.